Jumpstart your day with drinking a lemon ginger turmeric tea, a medicinal drink with potent anti-inflammatory and detoxing powers. This elixir is packed with antioxidants that improve digestion and detoxify the liver and blood. This all-natural immunity booster is extremely effective in treating a cold, cough, sore throat, fatigue, irritable bowel syndrome, chronic pain, and seasonal allergies. Lemon has a robust nutritional profile and it is associated with a wide range of health benefits. Some of them include treatment of constipation, sore throat, fever, indigestion, rheumatism, internal bleeding, throat infections, obesity, high blood pressure, cholera, and respiratory disorders. It has potent therapeutic properties, which help cleanse the stomach, purify the blood, and boost immunity. Its health benefits are due to its nourishing elements like vitamin C, vitamin B6, vitamin E, vitamin A, thiamin, folate, pantothenic acid, folate, calcium, iron, potassium, zinc, protein, phosphorus, magnesium, and copper. It also contains antioxidants and powerful cancer-fighting properties. Multiple studies have shown that ginger contains countless compounds and metabolites, many of which contribute to healing and heath. Shogaols and gingerols have been the most researched. Possible health benefits include relieving gastrointestinal (GI) irritation, suppressing gastric contractions, preventing constipation and colon cancer, relieving nausea and motion sickness, soothing cold and flu, reducing pain (dysmenorrhea, the severe pain that some women experience during a menstrual cycle in particular), reducing inflammation and treating inflammatory conditions, and reducing cholesterol. Turmeric is the most effective nutritional supplement known to mankind. It contains curcumin, a compound with potent antioxidant and anti-inflammatory properties. Its molecules have been shown to inhibit molecules that play a role in inflammation, which is the contributor to many common Western diseases. When it comes to its antioxidant capacity, it is important to note that it is capable of both neutralizing free radicals on its own and stimulating body`s antioxidant enzymes. Additional benefits include fighting degenerative processes in the brain, decreasing the risk of experiencing a heart attack, preventing and perhaps even treating cancer, reversing the progression of Alzheimer’s disease, treating symptoms of arthritis, and many more. 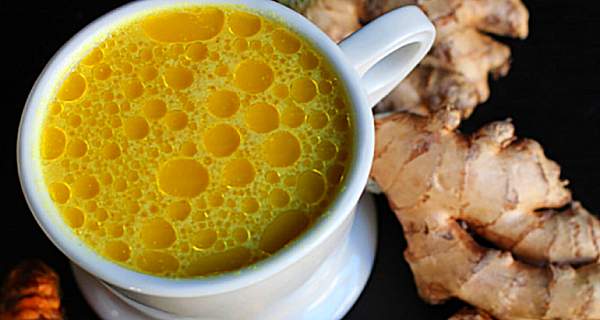 Combine the ginger, turmeric and filtered water in a pan on medium-high heat. Simmer for a few minutes, making sure it doesn’t boil. Strain the liquid and transfer into a mug. Add lemon juice and honey, if needed. Note: Be careful when you grate the turmeric root as it might stain the clothing or the counter top.